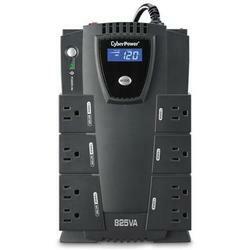 The CyberPower Intelligent LCD CP825LCD uninterruptible power supply (UPS) safeguards mid- to high-end computer systems against surges/spikes and offers battery backup in the event of brownouts or blackouts. The CP825LCD unit has a capacity of 825VA/450Watts eight (8) NEMA 5-15R receptacles including four (4) fail-safe outlets for critical loads. The intelligent multi-function LCD panel displays real-time UPS vitals for ease of control. This unit offers connectivity via one (1) HID USB port as well as protection for phone/network (RJ11/RJ45) and cable/coax (RG-6). It has one (1) maintenance-free user-replaceable 12V/8.5Ah battery and includes EMI/RFI filters to increase the immunity of the load to disturbances and surges. PowerPanel Personal Edition UPS Management software automatically closes computer files and safely shuts down the system in case of a power outage. A Three-Year Warranty ensures that this UPS has passed our highest quality standards in design assembly material or workmanship and further protection is offered by a $225000 Connected Equipment Guarantee.